Highly effective against horse flies. Protect Your Horses, Riders, and Trainers With Our Professional Horse Fly Trap. Since they feed on blood, their aggressive stings are very painful not only for animals, such as horses and cows, but also for humans. reducing them to an absolute minimum. 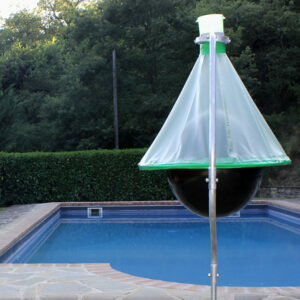 The H-trap is designed to be placed outdoors, where it works without the need for chemicals or electricity. Extensive independent trials have shown a reduction of 90-95% in horse fly numbers in areas protected by the H-trap can be realized. The horse flies are ‘tricked’ into mistaking the centrally placed black ball in the H-trap as a large animal, such as your horse. Like the body of the horse, the ball emits heat which attract them to it. Once they position on the black ball, they will investigate it and try to sting it. Since they will be unsuccessful in gaining their desired blood feed, they will follow their natural behaviour and fly away. Horse flies naturally fly upwards, hood system, where they are guided into a centrally placed collection bin. This is filled with water and they die in the trap. Position your H-trap(s) between these areas, but closer to places where animals congregate eg. stable yards. Check traps weekly, emptying and topping up with soapy water as necessary. If the H-trap is not catching sufficient numbers of flies, and you are sure adult emergence has started, reposition the trap. Horse flies are a constant nuisance, particularly during the period May – October in the northern hemisphere.